Nina Chua uses minimal apparatus to make her work. 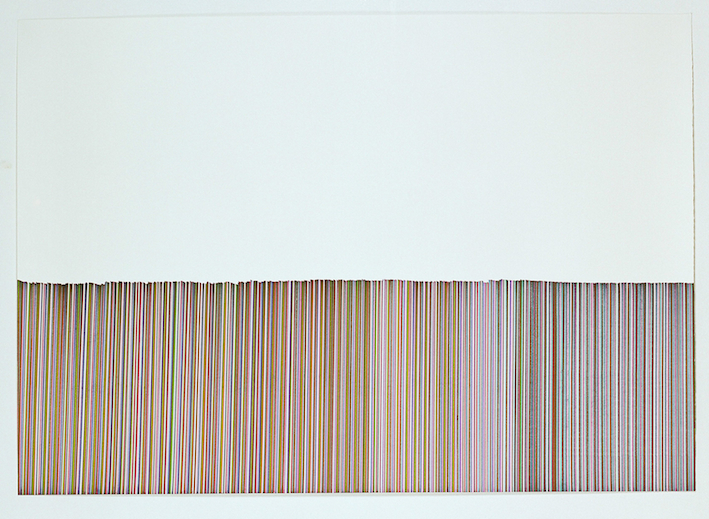 In her drawings, ruler and pen are used to inscribed lines of colour onto the surface of the paper. Gesture is intentionally limited to its most fundamental form, leaving line, colour and support to assume a pivotal role. The drawings forge a symbiotic relationship between image and process and as such emancipate from any narrative intention. For Android, Nina is showing a singular drawing. A mass of silver lines cover the surface of the paper. The application is deliberate, controlled and methodical and yet it is expressive, showing the glitches of its making and the touch of the artist’s hand. Nina Chua (b.1980) based in Manchester and graduated from MA Fine Art at Manchester School of Art in 2011. Recent exhibitions include: A Book is a Performance, Centrespace, Visual Research Centre, DJCAD, Dundee; One Two, Bankley Gallery, Manchester; Cabedal, Plataforma Revolver, Lisbon, Portugal; Meanwhile See This, Castlefield Gallery, Manchester; Part of the Programme, FAFA Gallery, Finnish Academy of Fine Arts, Helsinki, Finland. She was artist in residence at 501 Artspace, Chongqing, China in 2011 Her work is held in public collection, Centre for Artists’ Books, Visual Research Centre, Duncan of Jordanstone College of Art and Design, Scotland.